Disease is a major source of plant damage in roses with the most common rose diseases being caused by fungus. While some rarely-contracted rose diseases are caused by viruses or bacteria, more often than not, it is fungi that wreak havoc in our rose gardens. 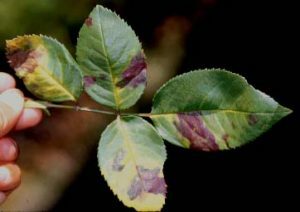 Nationwide, blackspot fungus (Diplocarpon rosae Wolf) is the most common rose disease. Powdery mildew (Alphitomorpha pannosa) runs a close second in its commonality, but unlike blackspot outbreaks tend to be seasonal. Occasionally, outbreaks of downy mildew (Peronospora sparsa Berkeley) and botrytis blight (Botritis cinerea) may be found, but these diseases appear much less frequently than either blackspot or powdery mildew. Damage due to fungal attack can range from one extreme to another on the seriousness scale – from repeated loss of leaves (weakening the plant) to less damaging symptoms of minimal lesions (spots) on foliage and canes. Roses with high levels of infection produce less new growth and fewer blooms because their leaves (which are needed for photosynthesis) are affected by disease and fall off. 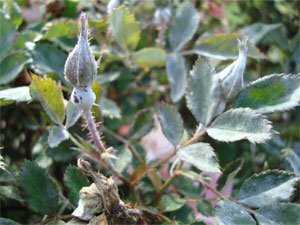 Because of the important role that foliage plays in the overall health of the rose bush, repeated defoliation ultimately impacts the health and longevity of the plant. leaves. Fifty years ago, Dr. Griffith Buck, identified the correlation of leaves to plant hardiness finding that roses with the ability to hold onto their leaves even when infected by fungus were hardier, more disease resistant landscape plants. This correlation has been reinforced through the Earth-Kind® Rose Research Program being conducted through a partnership between the Texas AgriLife Extension Service and the Houston Rose Society. Fungal diseases are best managed through a multi-disciplinary approach that includes: (1) plant selection, (2) planting times, (3) level of fertility, (4) sanitation and (5) applications of fungicides. Some roses exhibit more tolerance than others to attack by common diseases. The susceptibility of a rose variety to disease will dictate the management practices that must be employed to maintain the health of the garden site. eather conditions support disease formation) can initiate the process. There is some logic to this theory as blackspot and powdery mildew tend to attack new plant growth first. Heavy fertilization encourages the development of new growth that, if left unprotected, is fair game for fungal pathogens seeking a host. However, cultural practices alone will not eliminate diseases from the garden. “Fungicides” are a specific type of pesticide that controls disease by inhibiting or killing the disease-causing fungus. They work by (a) attacking and damaging cell membranes, (b) interfering with energy production, or (c) interfering with the life cycle of the fungus. Some of the newer disease treatments on the market do not directly affect the fungus itself, but instead boost the plant’s natural defense system causing the plant to produce thicker cell walls and anti-fungal proteins so that the plant is better able to defend itself when disease pressures are high. Examples of this would be products like Messenger and similar “biorational” treatments. While most fungicides are only capable of protecting uninfected growth from disease, only a handful are effective against pathogens once infection occurs. For this reason, to be effective most fungicides should be applied (a) when environmental conditions are right for disease development, (b) before disease occurs, or (c) at the first appearance of symptoms. Fungicides fall into two categories – “curatives” (products that attack fungi that have already infected the plant) or “preventatives” (products that inoculate plant tissue so that the plant is better able to fight off disease. Fungicides with curative properties would include products sold under the trade names, Mancozeb, Manzate and Fore and products containing Maneb. Preventative fungicides would include products such as Rose Pride (formerly known as Funginex), Rose Defense, Daconil and products containing Neem oil. Some homeowners start applying fungicides to their roses only when the plants lose all their leaves and then stop spraying once new growth emerges. Other gardeners use fungicides for the wrong purpose – for example using a preventative on a bush exhibiting symptoms of heavy blackspot infection. These treatment approaches are wholly ineffective in controlling fungal diseases. critical to establish disease control. I have found that it takes three weeks of regular applications of a curative fungicide in addition to good garden housekeeping to reestablish disease control. The need to spray should be dictated by four factors: (1) the health of the rose, (2) the environmental conditions, including the level of disease pressure that may be present, (3) the disease susceptibility of the rose, and (4) the desired level of plant perfection. Fungicides come in powder, granular and liquid form. Most are mixed with water and applied by spraying the mixture onto the plant. A few fungicides are applied to the soil where they break down into compounds taken up by the plant making the plant toxic to the disease. For spray applications, coverage of all parts of the plant (upper and lower leaf surfaces and from the top to the bottom of the plant) is critical because very few fungicides have the ability to be absorbed into plant tissue and move through the plant. One exception would be Aliette, which is applied as a spray treatment and then translocates through the plant’s system from the leaves to the roots and back to the foliage on a “seek and destroy” mission. 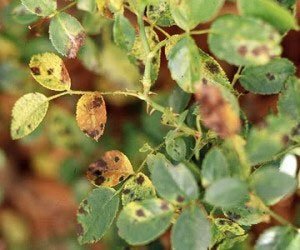 On susceptible roses, effective control of fungal diseases may necessitate multiple applications of fungicides – sometimes as frequently as once weekly from the first flush of new growth in the spring until the first hard frost in the fall. These repeated applications are necessary to protect emerging new growth and to replace fungicide product lost by decomposition, degradation by sunlight and/or removal by wind and water. Unfortunately, repetitive applications of the same fungicide can lead to the fungus developing resistance to the treatment – making treatment applications ineffective. (Fungicide resistance is discussed in another article in this series). Keeping susceptible roses healthy requires some application of fungicides, especially when conditions support disease development. Blackspot spores germinate and infiltrate cell tissue when temperatures are between 65 – 85° F and when moisture is present on the foliage for seven hours or more. Powdery mildew tends to appear when humidity is high but conditions are dry and cool (warm days / cool nights). Fungicide labels contain the words “contact” and “systemic”, which is a general description of the method by which the product kills fungal pathogens. “Contact” fungicides are applied to and remain on the plant surface and do not penetrate into plant tissues. Contact fungicides must come in contact with the disease-causing pathogen to be effective. Examples of contact fungicides are Mancozeb, Fore, Manzate and Daconil. Often these types of fungicides leave a spray residue on leaves and stems and only the parts of the plant with spray residue are protected from infection. Contact fungicides are very sensitive to the environment and are usually effective for 7 to 14 days, however product life depends the amount of rain/irrigation the bush receives and the amount of UV rays the chemical is exposed to. One to 2 inches of rain will reduce the residue of contact fungicides by half, but rainfall of 2 inches or more will eliminate the product from the plant. The product label will provide direction on application frequency. Systemic fungicides, sometimes called “penetrants”, are absorbed into the plant and have the ability to move from the application site (similar to how blood moves through our bodies). The distance that systemics are able to move within the plant is dependent on the nature and type of fungicide used. Some systemic fungicides stay in the leaf tissue. Others have the ability to travel from the leaves to the root system, but not back up through the plant structure. Only a few systemic fungicides, like Aliette, can travel up and down freely within the plant. Some of the common systemic fungicides used in rose gardening are Aliette, Fertilome Liquid Systemic Fungicide, Monterey Fungi-Fighter, Rose Pride (Funginex) and Bonide Systemic Fungicide. How a fungicide works is called its “mode of action.” Fungicides are manufactured in such a way that their modes of action attack either “single” or “multiple” sites within a fungus. Single-site fungicides target one critical component (usually an enzyme or protein) needed by the fungus for survival. The slightest mutation of the fungus impedes the effectiveness of the fungicide treatment by camouflaging the product’s target. Fungicides with single-site modes of action are Rose Pride (Funginex) and Green Light Systemic Fungicide. Genetic mutation of fungi is more common than we may think. There are 54 known variations of blackspot fungus in North America and these variations or “races” of the disease are frequently geographically specific. Roses resistant to one race of blackspot fungus may prove susceptible to other races of the disease. Fungicides designed to attack multiple sites are usually affective against different types of disease components within a fungus. These types of fungicides treat a variety of disease components so that in the event that there is a mutation of one particular enzyme/protein in the pathogen’s make-up, there are usually other non-mutated disease components for the fungicide to attack. Contact fungicides typically affect multiple sites in fungi. Examples of multi-site fungicides are Mancozeb, Manzate, Aliette, Fertilome Liquid Systemic Fungicide, Ortho Garden Disease Control and Daconil. In North Texas it is not uncommon for hybrid tea roses to require 15 to 20 applications of fungicides per year to maintain plant health. Along the Gulf Coast, environmental conditions can dictate even more applications and for a longer period of time. Sometimes even hardy roses may require a few spray applications when environmental conditions support disease development and disease pressures around the garden are high. Rotation of fungicide products that have different “modes of action” to delay the development of the resistance to chemical treatments. Does the Fertilome Liquid Systemic Fungicide travel up and down the plant as you mention Aliette does? We have almost 450 green giant trees and some that have been affected by Kabatina twig blight or spider mites per our local extension office. I have been spraying them with Mancozeb, but after reading your information, am now wondering if I should use a preventative systemic fungicide on the trees that currently look healthy. WE have the green giants planted in 2 rows offset with 15' between the rows, and 5' between each tree within the rows. The trees have grown to where they now touch in the middle and we cannot get between them to spray. We've lost several green giants due to either spider mites or fungus. Not sure which since the local extension office or local nurseries won't come out to the country to take a look at them. We couldn't make rhyme or reason as to why 1 tree in the middle of 50 trees was the only one affected as we knew they were all getting the same amount of water provided from our pond through a drip system that we run every couple of weeks throughout summer when needed. It's so sad to see a 30' tall green giant turn orange then brown and die! So, we're trying our best to prevent both fungus and spider mite issues. Last year we had approximately 20 big trees that died, all in different locations throughout the rows, and so far this year we've only lost one (knocking on wood). We've been spraying for both spider mites and fungus once per month this spring/summer. Thanks so much for your help! !